RBTH presents a selection of views from leading Russian media on international events, featuring reports on the impact the unfolding situation in Greece could have on Russia, an update on the unrest in Armenia and the possibility of Montenegro joining NATO. 1. How will Greece’s default affect Russia? Greece’s talks with its international creditors have ended in failure, the business magazine Expert reports. As a result, it says that the European Central Bank has suspended its program of emergency liquidity assistance to the country’s banks. In response, the Greek government introduced controls over capital movement and shut down banks. Expert points out that this situation will have an impact on all financial markets, in particular foreign exchange ones. It quotes analyst Vladislav Antonov of Alpari Group, a currency exchange broker, as saying that on June 26 the Russian ruble strengthened against the euro. This came on the heels of the news that the Greek government had rejected the rescue plan proposed by its creditors, which had been conditional on Greece carrying out reforms. 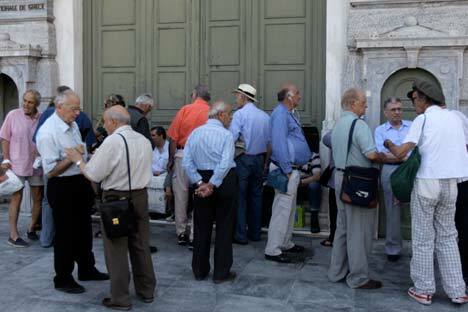 On June 30, Greece is due to pay back 1.6 billion euro to the IMF. If it fails to make the payment, IMF Managing Director Christine Lagarde will officially notify that organization’s Board, meaning that Greece has defaulted on its debts. Oleg Shagov, director of the analytical department of the Solid Investment and Financial Company, told Expert that since Western markets are largely closed to Russian companies at the moment, the Greek crisis would have a limited direct impact on the Russian economy. The Russian business newspaper RBK Daily reports that President Serzh Sargsyan has offered a compromise to protesters gathered in central Yerevan. President Sargsyan said that he thought it would be wrong to cancel the decision to raise electricity rates. He said that until the audit of the Electric Networks of Armenia company was completed, the government would cover the difference between the new and the old rates from the budget. If the audit concludes that the power grid’s demands are unjustified, the president did not rule out the possibility that the company could be nationalized, RBK reports. “At first, the authorities thought that it would be possible to disperse the young protesters,” the paper quotes Manvel Sarkisyan from the Armenian Center of National and Strategic Studies as saying. ”However, having realized that it could result in major complications, they have taken a time out. The scale of the protests is too big, so the authorities have opted for a compromise. However, the concessions are such that they could be easily reversed.” Sarkisyan went on to say that the latest events show that young protesters not associated with any traditional opposition forces represent a new force on Armenia’s social and political scene. “Civic activists’ movements like these require the use of resources from the government and ruling authorities to establish a dialogue with them,” political analyst Alexander Markarov told RBK. Markarov believes that these activists, if they themselves do not want to form a political force, could have a serious impact on the balance of power in the next electoral cycle in 2017. The Kommersant business daily reports that NATO has determined that if it does expand, an ideal candidate to join the alliance would be Montenegro. According to opinion polls, last week the number of supporters of joining NATO in Montenegro for the first time exceeded the number of those that are opposed. Some NATO members are rather reserved in their enthusiasm at the prospect of further expansion, thinking that it may create a new source of tension in relations with Russia, Kommersant continues. However, even with these reservations taken into account, many politicians and experts believe that the small mountainous country’s chances of joining NATO are high.